Cacao was an intrinsic part of ancient Mayan and Aztec life, not just as a beverage or food, but as a pillar of their economies and an integral part of their religions, appearing in numerous spiritual ceremonies—even death rites and sacrifices. If cacao was “a sacred offering to the gods combined with personal blood-letting through the piercing or cutting of their own flesh” to the Mayans, this page is an excellent reflection of that close bond (Seawright 7). The link between blood (or heart) and cacao was not exclusive to the Mayans: in ancient Aztec society, cacao was given to sacrificial victims, often in ways that directly linked chocolate and blood. During the annual Aztec ritual in Tenochtitlan, a slave would be chosen to represent Quetzalcoatl. At the end of forty days, during which he had been dressed in finery and given all manner of good food and drink, he was informed of his impending death and then made to dance. If the temple priests saw that he was not dancing as enthusiastically or as well as they expected him to, he was given a drink of itzpacalatl, which was a mix of cacao and water used to wash obsidian blades. These were sacrificial blades, and therefore crusted in blood. The sacrifice would be rejuvenated and joyful after drinking this mixture of blood and chocolate, and dance to his death (Coe 103-104). “It is the Tree of the South, the direction of the Land of the Dead, associated with the color red, the color of blood. At the top of the tree is a macaw bird, the symbol of the hot lands from which cacao came; while to one side of the tree stand Mictlantecuhtli, the Lord of the Land of the Dead” (Coe 101). This is one of many examples showing how ancient Mesoamericans linked their understand of divinity and spirituality with cacao (Seawright 5). 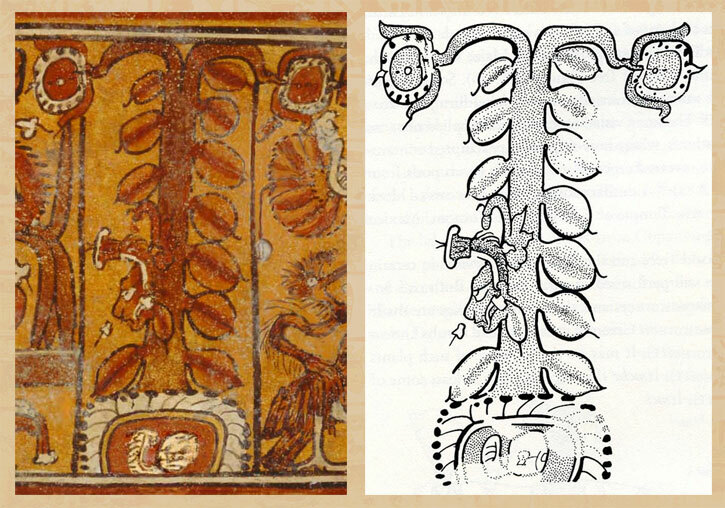 It is also yet another instance in which we see cacao as intrinsic to Aztec mythology and art, as well as connected to blood. Seawright, Caroline. “ARC2AZT Essay: Life, Death and Chocolate in Mesoamerica: The Aztecs and the Maya; Where Did the Ritual Use of Cacao Originate?” N.p., 2012. Web. 19 Feb. 2015. “Codex Fejérváry-Mayer.” FAMSI – Akademische Druck – U. Verlagsanstalt – Graz – Codex Fejérváry-Mayer. N.p., n.d. Web. 19 Feb. 2015. “Cacao in Ancient Maya Religion.” Cacao in Ancient Maya Religion. N.p., n.d. Web. 19 Feb. 2015. 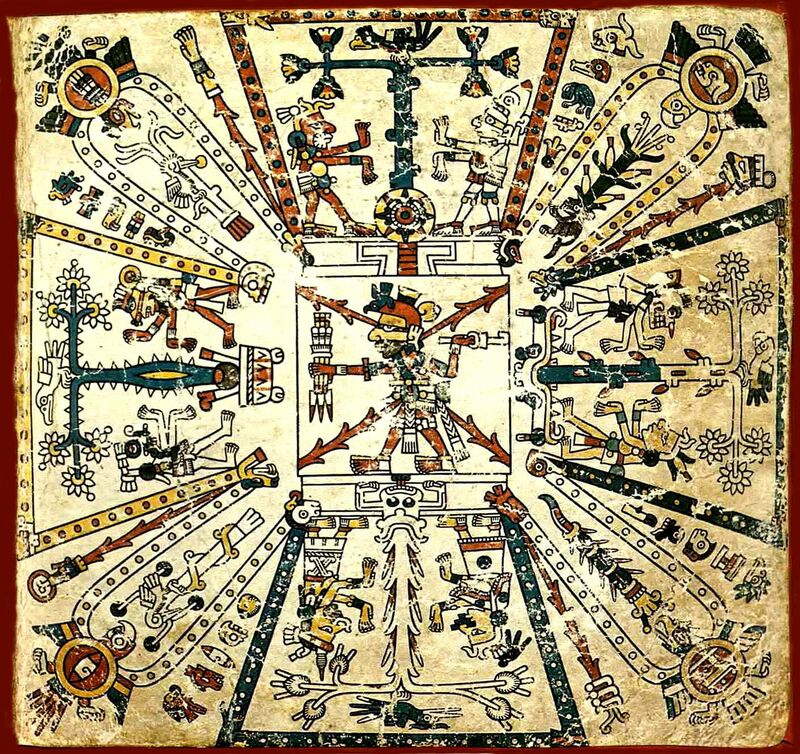 “Maya Codices – The Madrid Codex.” FAMSI – Maya Codices – The Madrid Codex. N.p., n.d. Web. 19 Feb. 2015.